toad trotter was sending mixed signals. On the one hand, she condemned everyone who mines AFK with a Hulk. On the other hand, she was mining without a permit--an equally foolish endeavor. Though toad trotter was spouting one Miner Bingo quote after another, she did manage to come up with some original ideas. This is the first time someone excused their AFK mining by claiming to babysit the EVE accounts of active duty soldiers. 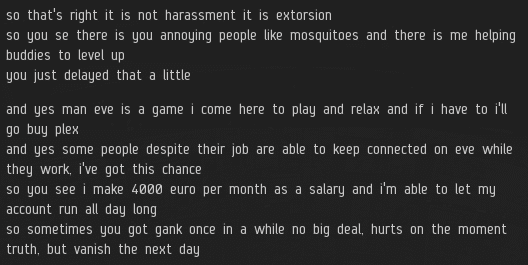 As everyone knows, when someone in the military is deployed, their first priority is making sure their EVE accounts continue to mine in highsec. This is, of course, illegal account sharing. As a highsec miner's EVEmail grows in length, the probability of hitting every Miner Bingo square approaches 1. Oh, what a tangled web we weave! toad trotter could no longer keep her story straight. 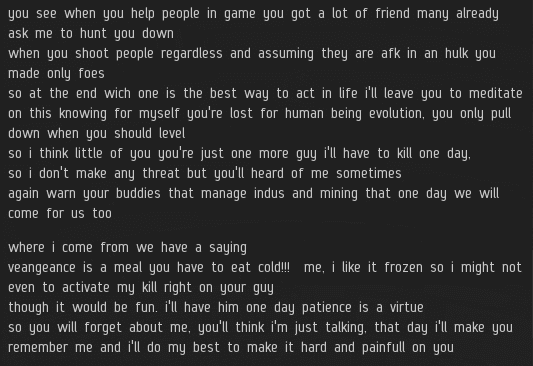 In her previous EVEmail, she wrote, "it's the second time i do mining i do not find it relaxing or whatever i just to it to get the yield in order to craft ship for pvp". Now she admitted that she mined "to play and relax". Another Miner Bingo square hit right on the nose. 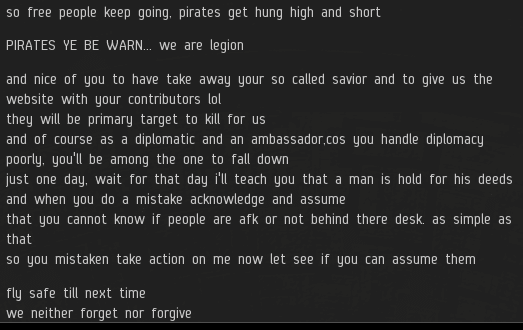 As toad trotter's EVEmail continued its grueling march toward a conclusion, more threats were made. Her Hulk would be avenged in time. Nevertheless, we must wait patiently. Very, very patiently. ...and it kept on going. toad trotter had more important things to say. toad trotter wasn't interested in breaking the record. She wanted to shatter it, pulverize it, grind it into dust, and snort the dust. Why would anyone assume toad trotter was mad? I'm sure she was perfectly calm when she wrote all this. There you have it. This time it's over for real. toad trotter's reaction to losing a fail-fit Hulk was truly extraordinary. Hopefully she got every ounce of rebellion out of her system. toad trotter would make a fine addition to the New Order family. Oh god. Hisec miner with no skills (other than hisec mining) and no friends (other than hisec miners) has our contributor list. I guess there is nothing left for us to do but biomass. Maybe she has powerful friends in Nullsec? You know, the fact that our Supreme Savior took the time to actually read and decipher this is proof that he is a bigger man then any of us will ever be. As it is spoken. I'll see that lol and raise you 2 :)'s. She heard that "brevity is the soul of wit", so she decided to keep her post to one sentence only. Epic post. I guessNew Order is doomed now ;). It's a rival to James 315 2012 forum opus.